Here is a finely detailed bronze of a male Indian Peacock. He is standing on a large urn depicting ruins of an ancient civilization. In the mid 19th century steam boats had placed travel to distant lands within reach of most Europeans. 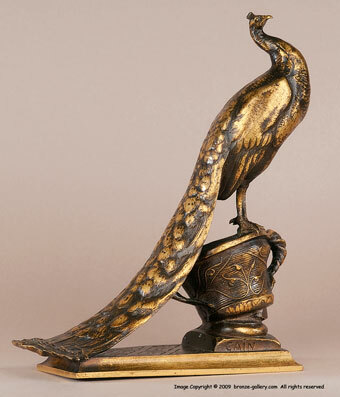 The Orient and Asia were very popular decorative motifs in many of the more affluent homes. Bronze sculptures depicting far away lands were very popular and this rare model of a Peacock would signify an exotic culture. Cain was known for his whimsical nature and he also did a sculpture of a Vulture on a head of a Sphinx. 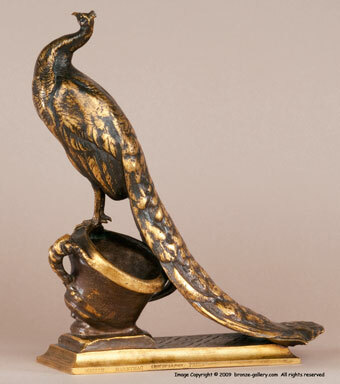 This bronze also has "Maison Marnyhac 1 Rue de la Paix Paris" engraved on the rim of the base which shows it was retailed by this fine old Paris shop. It is finished in a soft gilt gold patina.